Sew Can Do: It's a Winner!! I really love the dress for me though - it's really comfortable and can be both casual & dressy. As mentioned in my previous post on the dress, the design, The Window Shopping Dress, is just one single cut piece and easily converts to a "non-pregnant" shape just by moving the belt down and then ta-da! A fun, mommy & baby matching ensemble. I really love all the great fabrics at The Fabric Fairy and am so excited to use my winnings on more lovely fabric. Now, deciding on which specific fabrics....that's the hard part! That dress is beautiful and should be an award winner. I have yet to sew something for myself (besides loungs pants) that I am really proud to wear. But, I am searching for that perfect pattern. Traci, my first project for myself was lounge pants too:) This dress was from One Piece Wearables which has loads of cute & easy to do patterns that may help in your search. 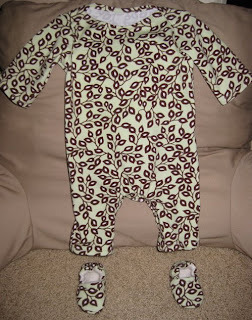 Rae, your arrival day is a few weeks sooner though, so you'll have a head start on the fun of getting to dress baby up!